Energy Conservation and Latest Projects! Hello Hollywood Staff! The Green Team would like to inform you of some new ideas and projects we currently have planned. Thank you for putting your used markers in the marker bins so we can send them to Crayola to be recycled! Green Team's student members will be collecting recycling from your blue bins. Kick-off started November 15th; this will continue until April. They make decks and other outdoor products out of recycled plastic! 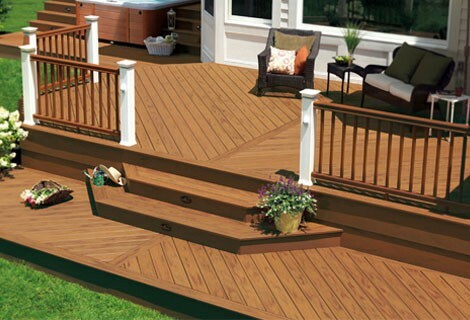 (Below is an example composite deck). We are going to be collecting many kinds of plastic bags and enter the competition to recycle as many pounds of plastic bags we possibly can! We are hoping this will encourage recycling within our Hollywood community and families. There are 3 white bins to turn in plastic bags. Christine Allen will collect them when they are full so she can weigh and deposit the bags. They can be all kinds of plastic bags as long as they are clean and free of food residue. The TREX company provided each student with a magnet for their home to remind families of what they can bring to school to aid us in our competition!! The parents and kids can just drop them off on their way into school. A PeachJar flyer will be sent to parents soon. St. Mary's County Public Schools would like to focus on ensuring we are "being green" by conserving the energy we use and "helping to reduce our $5.7 million dollar utility budget."